Add lime juice, agave syrup, Cointreau, mezcal, and Tabasco to a large pitcher. Fill with plenty of ice, and stir thoroughly. 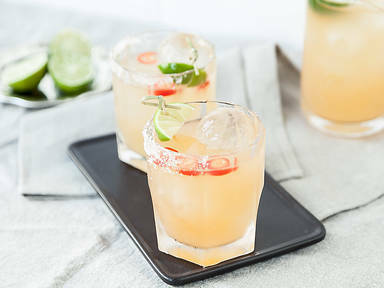 Strain into an ice filled, salt rimmed cocktail glass. Garnish with chili rings and a lime wedge. Enjoy!